Consumables and replacement parts will be available until 31st December 2019. Virtual Phlebotomy is a comprehensive, self-directed learning system for training phlebotomy from the novice to the expert level. 50 case scenarios presents students with the clinical information needed to execute each procedure, build decision making skills, challenge their knowledge, and master procedures. 29 unique patient models present normal, abnormal, difficult and uncommon cases. Virtual Phlebotomy assesses all cognitive and motor skills from patient interaction to motor skills during venous accession, to proper order of draw, to proper specimen handling and mixing, to proper tube labeling. The self-directed learning system records and evaluates students' performance and presents a thorough debriefing following each case. 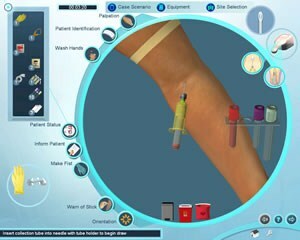 Virtual Phlebotomy conforms to CLSI (formerly NCCLS) and OSHA standards and guidelines. Training objectives and assessment correspond to the CLSI guidelines. Powerful 3D graphics and a force feedback device provide absolute realism in appearance and feel when performing the procedure. Rich content, immersive simulations and game-like challenges engage and motivate students. Choose from 2 dozen pieces of virtual equipment to perform the medical procedure.